I have to admit, I’m a total sucker for trends. And right now, unicorns are all the rage. You’ve got unicorn drinks at Starbucks, unicorn horn hairbands, unicorn lamps and mugs and pool floaties and… pretty much everything else! I totally dig it. But actually, I think unicorns have always been beloved. I remember playing with unicorn toys when I was a kid (aka a million gazillion years ago). 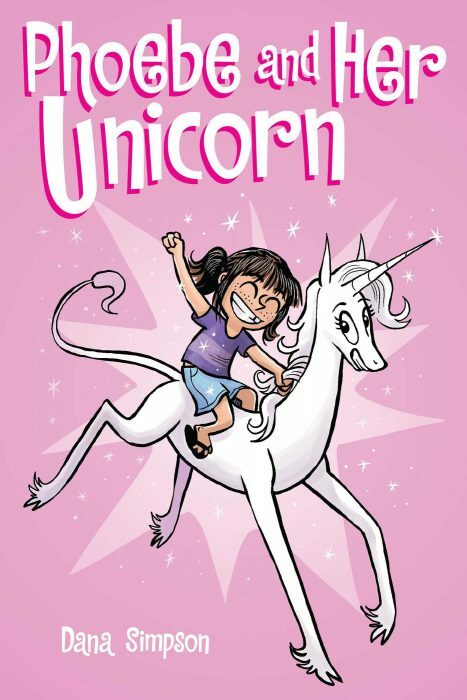 And author/illustrator Dana Simpson has been publishing her comic strip, Phoebe and Her Unicorn, since 2012 — way before the current wave of unicorn mania. Based on that video, I think you can tell how funny and delightful these books are! Phoebe is a bit awkward and a bit anxious, but she’s also high-spirited and always up for adventure. Marigold is haughty and vain, but also a caring and supportive friend. Together, these two besties make a pretty hilarious duo as they get into all kinds of hijinks. The next book, Phoebe and Her Unicorn in the Magic Storm, comes out in October! If you’re still not sure whether this series is for you, then check out the online comic strip. 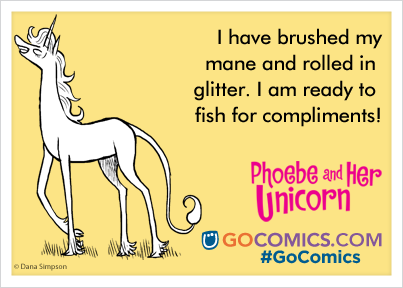 I think that once you spend some time with Phoebe and her unicorn, you’ll want to join them for even more adventures! Now here’s my question for you: If a unicorn offered to grant you any wish in the world, what would you wish for? Leave a comment with your answer! Karen’s wish would either be world peace or a free lifetime supply of sushi.